If you have pets you've already accepted the fact that your home will be perpetually covered in a layer of fur. Visitors, though? Probably not as keen. 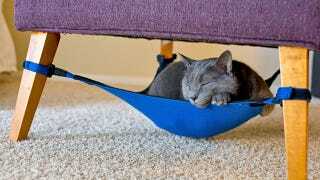 So this tiny hammock lets your cat still use your furniture without leaving it covered in hair. It's just $30—available for pre-order now—and straps to the legs of most reasonably sized chairs using a series of velcro bands at every corner. Besides keeping pet accessory clutter to a minimum, the Cat Crib also provides a place for your feline to hide out—whether they're simply looking for some privacy, or a place to disappear after being a bad kitty. How Do You Function, When One Hand Is Out of Commission?